If you think about it, the average person spends a third of their day in their bedroom. For this reason, when you do climb in your bed after a long day, you’ll want to make sure that it is comfortable and that you feel completely at ease. If you want to cosy-up your bedroom then you can find a few helpful hints and tips below. If you want your room to instantly feel welcoming and cosy then one way for you to do this would be for you to use warm colours and to also utilise neutral colours as well. This could include beige, greys, browns and even blues. This also gives you the chance to change things up when winter or even summer comes along, so you know that you can always have a blank canvas to work with without compromising the overall feel of the room. Warm materials will really help you to bring out the various aspects of the room. You’ll want to look out for things that include stone, wool, rattan, linen, wood and more. These will really help your room to feel comfier and it can also help your room to feel less manufactured. It helps to stay away from things such as plastic in this instance because it can make a room feel cold and it can also add a hard feel to the decoration as well. If you can’t find rattan then it is more than possible for you to opt for wicker, but the price will be much more when compared. Blackout curtains really are essential if you want to have a good night’s sleep. If you don’t have blackout curtains then there is a high chance that you are compromising your own sleep at night and this is something that you’ll want to avoid. It is also possible for you to get curtains or blinds that help to block out sound as well, and this is ideal if you are sick of hearing the birds chirp in the morning or if you want to block out some of the windy noises during bad weather. Rugs are ideal for the bedroom. When you step out of bed in the morning, the last thing you’ll want to do is step onto a cold, hard floor. If you want to avoid this then try and choose a wool rug or even a furry rug. This can make all the difference and you don’t need to for white or cream in this instance either. You can easily opt for brown, black or even light blue. This will help your room to feel warm and welcoming as mentioned above, but you shouldn’t be afraid to try colours that are a little bit brighter and a little more unique. After all, your bedroom is your personal space and you’ll never feel comfortable in it if you are not happy with the design, or if it just isn’t “you”. A lot of people have an overhead light in their bedroom but the truth is that this is not required at all. You usually never need to have this much light and that is especially the case in a room where sleep is paramount. Try and get rid of your overhead lighting and have a ceiling fan to keep you cool in summer. You can even have some wall lights or some lamps around the room. This will help you to really set the mood when the time for sleep comes along! 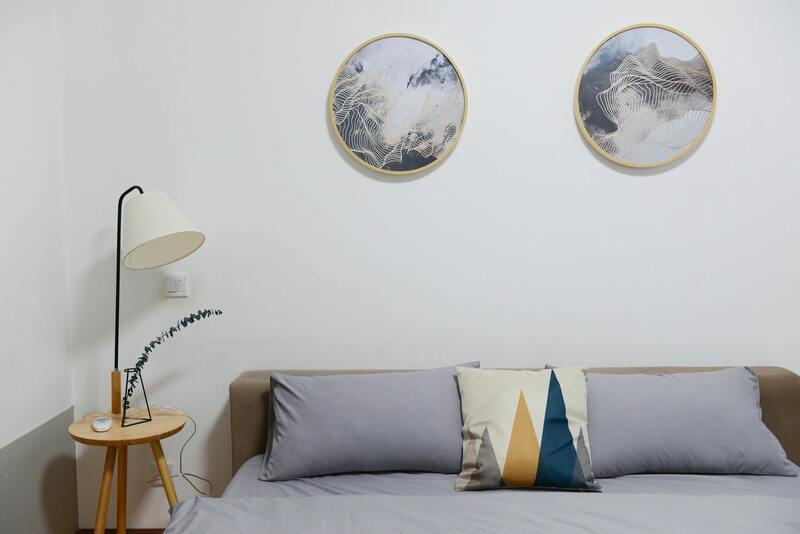 Remember you can easily match in the lamp shades with the room and this is a great way for you to make the most out of your room and what it has to offer you. Sure, you may think that burning candles in the bedroom is risky. This is especially the case when there is so much fabric, but if you put the candle in a glass jar then you’ll soon find that it is completely safe. There is nothing as romantic or as cosy as having candles lit and it can really help you to relax as well, so if you want to try and get the most out of your room or if you want to jazz things up a bit then candles are certainly the way to go. You can choose to have tealights, taller candles or even stumpy ones, the choice is yours and it all depends on the look and feel of the room. If you want to get the best result out of your bedroom then buying the best pocket sprung mattress is essential. You’ll want to do everything you can to make sure that your mattress is supportive of your back and neck, while also dressing up your bed with throws, pillows and even a new bed sheet. It’s quite surprising how much of a difference having new bedding can make and it can also help you to sleep better at night. If you love the feeling of hotel covers and sheets then try and go for a flat cotton sheet on the bed, and always leave the window on vent so when you climb into bed you have that cool, fresh and crisp feeling of the covers. If you prefer to have things a little warmer then why not consider investing in an electric blanket? This is one of the best ways for you to heat things up a little and the feeling of climbing into a warm bed is unlike any other. Art is very taste-driven but it can be a great way for you to make your room feel more homely and more comforting. Try and avoid bright or high-energy colours such as oranges, yellows and reds. Instead, opt for grey, blue or green tones as this will help to create a sense of tranquillity in the room and it is also great if you want to make the whole room feel more relaxed as well.